Rooftoppers is a full-service roofing company and we have a team of experts with over 100 years of combined experience. When choosing composition shingles for your roof, we can provide you with a wide variety of options that will fit just about any need. We also have a full fleet of well-maintained trucks with state-of-the-art equipment to get your project done and get it done right! And, we are fully insured and carry workers compensation and liability insurance so you have nothing to worry about. Additionally, we are also a Golden Star Applicator of Certainteed fiberglass shingled roofing systems, which is something not many roofing contractors can say they have! We are not a fly-by-night roofing contractor. Our company has been in business for 33 years and has remained in the same location since we first opened for business. What that means for you is that we will be here for you when you need us, whether you need roofing repairs, a replacement or you have a warranty issue. You should never contract with any roofer who does not have a local address and phone number and one you can’t properly vet. Your roof is one of your biggest investments; therefore, you should never take any chances by hiring a contractor solely based on price. What are your home and its contents worth to you? PRICELESS! Composition shingles are the most common type of shingles used on single-family homes. They are also the easiest to maintain and are the least expensive roofing option available. Composition shingles are made with a fiberglass reinforcing mat that is in the center of the shingle. It is then coated with mineral fillers, asphalt, then embedded with a layer of ceramic granules. There are three different types of composition shingles available. 3-tab shingles. These are asphalt shingles that have three regularly spaced tabs, giving them a repetitive pattern. 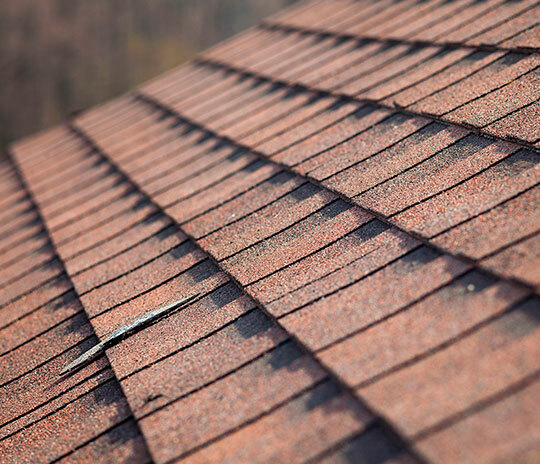 These shingles have a life expectancy of approximately 20-30 years. Architectural shingles. These are also known as laminate shingles or dimensionals, and in contrast to 3-tab shingles, they have two layers of shingles that are bonded together, which gives them a three-dimensional appearance. These shingles have a life expectancy of approximately 50 years and some have even been known to last a lifetime. Designer shingles. These were made to extend the shingle concept to include countless styles that range from an Old World look to a Victorian, rugged or some other type of dramatic cosmetic effect. When having composition shingles installed on your home, it’s imperative that you hire a roofer who knows what they’re doing. If you don’t, and the roofer you’ve hired doesn’t install your new shingles to the exact manufacturer’s specifications, it could void your warranty. Some manufacturers require their shingles to be hand nailed and others have very specific requirements as to how many nails should be used per shingle and where those nails should be placed. So as you can see, one uneducated or careless roofer could cost you dearly. Composition shingles, also known as asphalt shingles, are the most widely used, least expensive type of roofing material available in the United States. Not to mention composition shingles come with a multitude of benefits, which is probably why they are so popular. Here are just a few of the reasons people opt for composition shingles versus any other type of roofing material.